Home » Blog » Internet Marketing » SEO Client Becomes a Google Favorite Place! We’re happy to announce that one of our clients, Display Group (a Detroit Corporate and Special Events Rental Company), has become a Google Favorite Place! What does this mean? It means that they are part of less than 1% of businesses in the U.S. to receive this distinction. That’s out of over 28,000,000 businesses! Businesses were selected for the popularity of their listing including how many times someone clicked on the listing and searched for it. 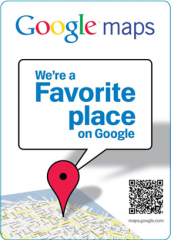 You can view Display Group’s Google Places listing and view the Google Favorite Places FAQ. While we would love to take all of the credit for Display Group’s success on Google Places, we have to admit that their great products and service to clients is the main reason they are a favorite place. We just helped people find them. If you’re not on Google Places yet or you want to get more leads from it, read Google Places and Local Search Traffic.